Summer season is here and so is our list of best ac under 25000 available in India as of April 2019. We have listed the best window and split air conditioners from top brands like Hitachi, Voltas, Carrier, Llyod, and few others. These air conditioners are great for home or office use. You will find both 3 star and 5 star rated power efficient air conditioners with aluminum coil and copper coil condensers. Copper condensers are little expensive as compare to aluminum condensers but they do last longer and offer better cooling. If you are looking for inverter AC then you need to increase your budget. Still, we have included an Inverter AC which is priced around Rs. 25000. If you are specifically looking for a split AC with a copper coil, you can check the best 1.5 ton split ac with copper coil. The price of air conditioners on this list varies from Rs. 20000 to 25000. If you can spend more then take a look at our list of best ac under 30000. The capacity of ACs is 1 ton to 1.5 ton. This is an important thing to keep in mind. If your room is small and has an area of around 100 sq. feet( size = 10x10 feet) then you can go for 1 ton ac. If your room is bigger and has a size of around 12x12 feet which means around 140-150 sq feet then go for an AC of 1.5 ton. 1.2-ton AC is great for a room of size around 120 sq. feet. Let's go through the list of best ac under 25000 in India. Our favorites are given at the end of this article. This Hitachi Air Conditioner is a 1 Ton window type Air Conditioner with 5 Star BEE Rating. It has the cooling capacity of 3500W and for its best performance, it should be installed in small-sized rooms with an approx area of 90 sq ft to 100 sq ft. It has Copper Coiling which makes it a strong performer and will have a longer life than other Air Conditioner with Aluminium Coiling. The 5 Star BEE Rating makes it very power efficient and it will consume about 10-15% less electricity than a 3 Star Rated Air Conditioner. This Hitachi 1 Ton Window AC has a strong build quality and comes with Auto Climate Technology by which it can adjust the room temperature as per the humidity and outside temperature. It is a powerful product and also has common features like the auto restart in case of power cut. It comes with Kaimin Feature through which it adjusts the temperature that suits a human body during the night. The Koulin Filter in this AC is responsible for providing clean and hygienic air and an alarm indicator when this filter needs to be replaced. Hitachi is one of the top companies in Air Conditioner brands and offers great after sales service. Hitachi branded AC is a little costlier but it is due to the powerful cooling and build quality it offers. If your usage is more than 4 hours in a day, then you should prefer a 5-Star AC to save on electricity bills. Go for it if you are looking for a 5-star Window AC under 25000 as this AC will fulfil all your requirements. Blue Star is one of the best air conditioner brands in India. Their products are of high quality and they have an extensive after sales service network. This window air conditioner from Blue Star has a 1.5-ton capacity suitable for a medium-sized room of around 140 to 160 sq feet. The cooling power is 4900 W and it consumes around 1700 W because it has a 3-star rating. The AC offers powerful cooling and it will cool down your room in just 10-15 minutes. On the features side, you will see all usual features like timer, sleep mode, auto restart, anti-bacteria, and dust filters, auto air swing, night glow buttons on the remote. There is a display on the front of AC which displays the temperature. Overall, it is a great and one of the best options in the 1.5-ton window ac category. If you are looking for a power efficient window AC under 30000, then this should be your choice. Voltas, a TATA Product, is one of the leaders in the Air Conditioner market and is known to offer Good Value for Money. This Voltas Window AC has a capacity of 1-ton and is suitable for small sized rooms that have an area of 100 sq ft or less. This window AC has a 3-Star BEE rating making it well power efficient and consumes around 0.9 electricity units per hour. It has a cooling capacity of 3170 W and serves some basic features like Turbo Mode (to cool a room quickly), Auto Restart after power cutoff, Anti Dust Filter to prevent the accumulation of dust, Sleep Mode that automatically adjust the cooling temperature to allow you to sleep comfortably. This AC does not have any special feature like filters to kill bacteria and germs but does the basic work perfectly. It can provide effective cooling to a maximum of 50 degrees outside temperature which is decent enough considering the temperature is lower at night and stays less than 50 degrees during the afternoon in most of the states in India. Voltas has a huge network all over the country and offers speedy service after sales. If you are looking for a budget AC for your small office or small room in your house. You can buy this Window AC. In case you have high usage and are worried about the electricity bills, then you can choose this 1 ton 5 start AC. 3 Star Rated hence power efficient. Best service after sales because of huge network and service centre. Midea is a global company and they have entered the Indian market recently in 2018. They have launched a range of Air conditioners in India and sold a huge number of units. The prices are low compared to other brands and quality is really good. You can call them the Mi/Xiaomi of ACs. This air conditioner from Midea comes with a 1-ton AC with 3500W cooling capacity suitable for a small sized room having area of around 100 sq. feet. This is a 3-star inverter AC so you get excellent power efficiency as the inverter AC consume further lower electricity. It consumes less than 1000W of electricity which is really good. This AC is priced around Rs 25000 and is a great deal for an inverter AC. Apart from a great price and quality, this AC offers some great features of which some are unique to this Midea AC. The first one is Follow Me by which the indoor unit adjusts the temperature by using a sensor inside the remote(which is usually kept near you) and help provides proper cooling in the complete room. Secondly, in this price, it offers refrigerant leakage detection and shuts off the AC to prevent further damage and displays the error code on the digital display for quick remedy of the problem. The next feature is the self-cleaning where with a click of a button it cleans the AC from all dust and bacteria. It also comes with of energy saving indicator to check and control the consumption you get at the current setting. Another plus point of this AC is that it can work without voltage stabilizer and takes care of voltage fluctuations on its own. Overall, it is one of the best inverter AC in 2019 under 25000 pricing. MarQ is a subbrand of Flipkart and manufactures many electronic appliances like AC, Washing Machine, Microwave etc and has got a good response from users despite being a new brand. For this AC, users have rated it a whopping 4.3 on 5 from over 600 ratings. For them, 2019 seems even more bright in terms of sales as they expand and improve on their service. This is a split type 1.5 Ton AC and is available for a cost of under 25000 which is one of the best prices in the industry. It comes with a 3-star BEE rating and is efficient in terms of electricity and power consumption. Also, the condenser is build of 100 percent Copper which ensures long life and better cooling. Quality wise, this AC is a good pick if you have a budget of 20k to 25k and with improvement in the MarQ network, you would get quicker and better service these summers. In terms of the warranty, you get 1 year on the complete product and 5 years on the compressor. In case, you use the AC for more than 4 to 5 hours in a day, then you can also look at the 5-star rated MarQ Inverter AC here to save on the electricity bills. It costs around 30000 but you can save a lot of the yearly power usage. This is a 1 Ton 3 Star rated Window air conditioner from Blue Star. Blue Star is a top brand in air conditioners category and their products provide great performance with decent power efficiency. The after sales service network is decent and you won't face any issues while availing regular service. This 1 Ton Window AC has a cooling capacity of 3250W and consumes around 1100W of electricity. The cooling capacity is suitable for a room of area around 90 to 110 sq. ft. If you have a room of around 12x12 sq. ft then go for 1.5-ton window ac. This Blue Star Window AC has a basic design. There is a small display on the front to display the temperate. Buttons are provided around the display to change the temperature, mode, and other settings. You get modes like Auto, Cool, Fan, Dry, Energy Saving Mode. It has Anti Corrosive Blue Condenser Fins which provide excellent cooling and also last longer. 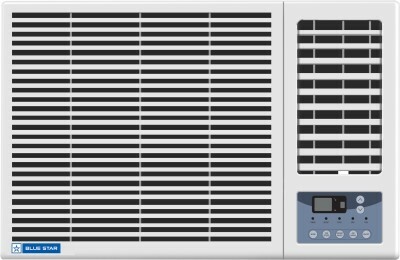 If you have a budget of around 20000 then this is the best 1-ton window ac you can get in India. So this was our article on 10 best ac under 25000 in India. We hope this list was useful. If you are a bit confused and not able to finalize an AC then take a look at our favorite air conditioners below. If you are looking for a Window AC then go for Voltas 1.5 ton Window AC.